For other dimensions and other species, including Aspen and Birch, call or email for a price quote. If you are interested in unpeeled posts, please call or email us for a price quote. 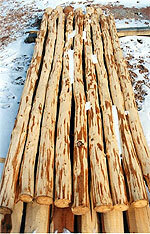 The first picture above shows freshly-peeled Eastern Redcedar hand-peeled post (rails). Redcedar is very good for areas where rot is a concern. Local ranches are still using cedar hand-peeled posts which were set in the ground 100 years ago. 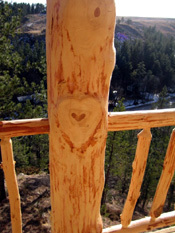 The second and third pictures show the beginning and end of freshly-peeled Ponderosa Pine hand-peeled posts. 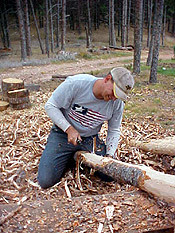 Zoom Josh is peeling a fresh-cut Ponderosa Pine with a drawknife. 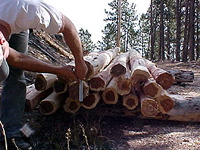 Zoom Ponderosa Pine Hand Peeled Posts fresh-cut with a drawknife. 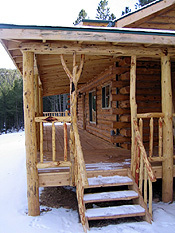 Zoom We can select hand peeled log posts with character for customers who want something special. Page last updated May 25, 2016.